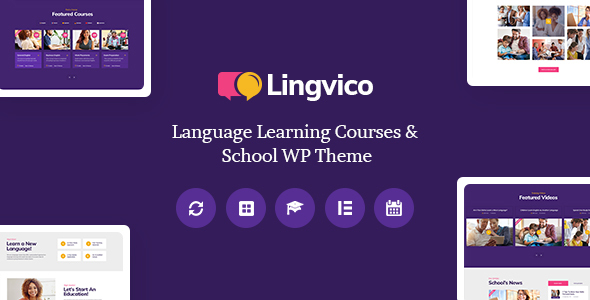 Lingvico is as trendy & stylish Education Center & Training Courses WordPress theme with contemporary, clean & fresh design. Lingvico is a perfect option for language center and tutoring services, as well as educational establishments like colleges and schools, trainings and courses, both physical and online. Also, it works for language centers bureau, tutoring services agency, etc. The theme is good for schools that offer different types of courses and classes, due to custom post type integration. An elegant design is compatible with the latest version of the Elementor Page Builder which makes it super easy to create your own page layouts. Besides that, the is compatible with such premium plugins, as Essential Grid, Slider Revolution, etc. Also, you have a chance to add the courses service module (via Learnpress, a powerful LMS plugin) that will help you easily manage and display your educational courses to your clients. Lingvico has plenty of premade pages, blocks and shortcodes. Thus you can build any education oriented website with no coding skills required. Just use the ready-made modules. Moreover the theme is SEO optimized, Retina ready and 100% responsive. So due to these awesome features, Lingvico is the best education& learning center solution!